Each drop of Quick D contains 1000 i.u. (500 i.u. 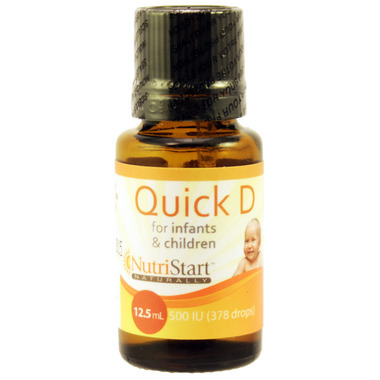 Child's) of naturally derived, biologically active vitamin D, now known to prevent numerous diseases. Quick D is made with some of the most stable ingredients available. The base contains vitamin C (Ascorbyl Palmitate), Vitamin E (Mixed Tocopherols) and organic Sunflower oil. Most liquid vitamin D products use an undefined generic vegetable oil for their base, which may contain various possible allergens. Today known as the "sunshine vitamin," in days of yore vitamin D was known as the "antirachitic vitamin," due to its use as a treatment for rickets (a disease causing bones to become soft and bendable, leading to bowed legs, knock knees and other bone malformations). These days the winter blahs and the longing for a sunny tropical vacation may be more modern indicators of a vitamin D deficiency. It’s been estimated that as many as 80% of Canadians may have dangerously low levels of vitamin D, during our long winters. The supplement is now being prescribed for such problems as low energy, depression and joint pain. Even celiac disease (gluten-sensitivity) is indirectly linked to a deficiency of vitamin D.
Nice that it is one tiny drop, instead of a whole medicine dropper-ful!